I recently wrote an answer on an SE site. Voting and comments got a bit heated and I posted a comment that was not "nice". It was on my own answer and had no mentions, so nobody got pinged. After ten seconds thinking about it, I deleted the whole answer. I was assuming the whole thing was gone (or only accessible to 10K privilege users) including all comments, because in my UI seeing the thread, it was this nice red box that you probably know. Deleted content. 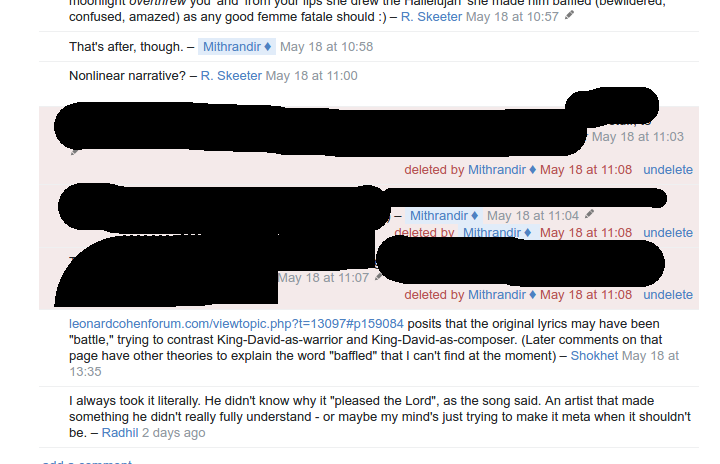 Meanwhile, the comment itself was probably not marked "deleted" in the database. Because following the programming, it wasn't, the answer was. This means that if a moderator were to pull up the list of all comments I posted in the mod tools, they'd see the comment as if it were still "live" on the post. This leads to the fact that mods see my "offensive" comment as active, not deleted in their view... while I am perfectly happy having "deleted" it after 13 seconds. Please improve the mod tools so that mods and I share the same view on content. If I delete something that basically lets the comment vanish, this should be clearly visible in the mod view. Some indication in the comments list that while the comment may be not deleted, its parent post is. Not the answer you're looking for? Browse other questions tagged feature-request comments moderator-tools deleted-answers .